John and the people at Up-Town Auto went above and beyond when they answered my call. They got me in a 2 days faster then the 3 other shops I called and the bill was 86.00$ cheaper then when I had my starter replaced 2 years ago at a different shop plus he also rotated one of my tires. I will definitely be returning for any more work I need done in the future. Do you need your car worked on? Do you want an honest price and honest work? Do you want a fun person to talk to while she asks you about what you broke? Go here. Just stop googling and make an appointment already! Been going to Uptown for years with various cars. Every time I try to get an estimate elsewhere the place is always more expensive with worse service. Uptown is reliable, friendly, and they don’t try to hustle you out of money for every little thing. They’ve worked with us on a lot things and have never let us down. I have been a customer of UpTown Auto for about three years. I have always found John Schneible eager to explain his findings. John goes out of his way to make sure I understand the reason the work he recommends is necessary. He also goes out of his way to make sure I have all the information I need to make an informed decision. I met John Schneible when he first opened his shop. I have found John to be one of the most up-front, honest guys I have met in a long time. My daughter and son-in-law had their van worked on by John upon my recommendation and were completely pleased with the work, the repair time, and the quality. 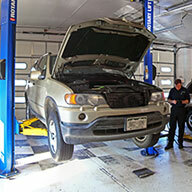 UpTown Auto is an extremely professional and competent auto service and repair company. While traveling from Lafayette, Louisiana, to Yellowstone via the RMNP, one of our fellow Miata drivers had an alternator fail while in Loveland. By a stroke of luck, we happened upon John Schneible, owner of UpTown Auto. John repaired the car in record time and at a very reasonable cost. John’s shop is quite different from your ordinary repair shop: it rates 5 stars out of 5 on any indicator. In my 49 years of driving, repairing cars, and having them repaired, I have never met a more personable and competent auto professional. We’ve been customers of John’s for over five years and have brought our automobiles to him for service and repair. John is one of the most trustworthy and honest businessmen that we have known. John doesn’t do guesswork. He’s very professional, and there hasn’t been a problem with my vehicles that John hasn’t properly diagnosed. The reason that I continue to bring my cars to John is because of his integrity, honesty, mechanical expertise, and professionalism. Whenever John has discovered other problems in doing repair work, he always calls me immediately to inform me of what he discovered and what the approximate cost would be. I would definitely recommend John to anyone for automobile repair work. He is a top-notch mechanic. Thank you for all your help, John. It didn’t go unnoticed. I trust your opinions and experience, also your kindness. I will recommend you to anyone who asks. Thank you so much for being willing to stop your day to check my car’s “Check Engine” light! It sure gives me peace of mind. I will continue to recommend your shop to those who cross my path. This is the best auto repair shop I’ve ever been to! The quality of the work is far above any of the other shops I’ve used. John is an honest, hard-working guy and a real joy to work with whenever I go in. We appreciate so much having someone in whom we have faith & confidence and who always does excellent work. Thank you! Thanks for the great service you provide!